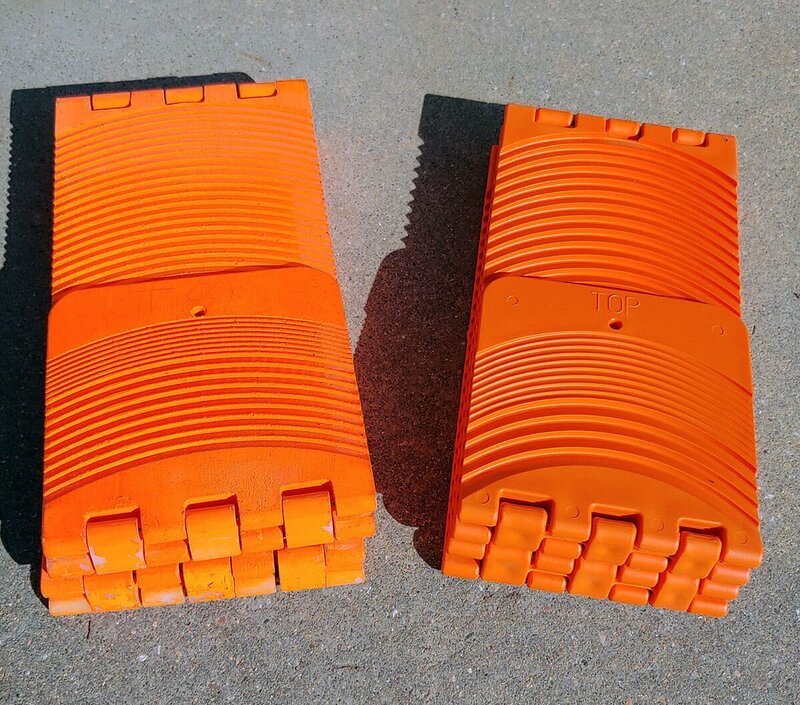 The 1975 Prototype on the left & the 1991 first production Go Treads on the right. This Go Treads History is presented to you not to bring attention to what our family and I did but, hopefully, to inspire you to rise above your circumstances and become what you are destined to be. We are blessed here in the United States (as are many of you in other countries) to be able to “chase your dream”. Unfortunately, clouds move in and the rays of our dreams get obscured. Those clouds are different for each of us. It could be from what our teachers say to us, our family members, classmates, fellow workers, the neighborhood we live in, the government, you name it. We are all different and come from different backgrounds but there is at least one very important thing we have in common – we were given a destiny to seek out and achieve during our short stay on earth. Please give credence to what your heart tells you and rise above what the naysayers yell in your ears. In the business world, I’ve learned that at times you have to have tough skin… tough skin, but a tender heart. In our story, I will share our successes, heartaches, disappointments, near financial ruin, blessings and very stupid decisions on my part. Through it all, my family – Mom & Dad, mother-in-law & father-in-law, brothers & sister, wife & our four children, cousins – and others who invested in Pinto, Inc. have supported us even though no dividends have ever been issued since the beginning of our company in 1991. To all of them, I owe so much gratitude for not pressuring me to make money for them… yet. Inspiration, Good Engineering and Persistence endures. While living in Cary, Illinois (a small town about 50 miles northwest of downtown Chicago) I constantly had to deal with deep snow. We lived right on US Highway 14 and snow plows were constantly plowing snow into our driveway. I had to come up with a way to get out early those winter mornings to get to work. 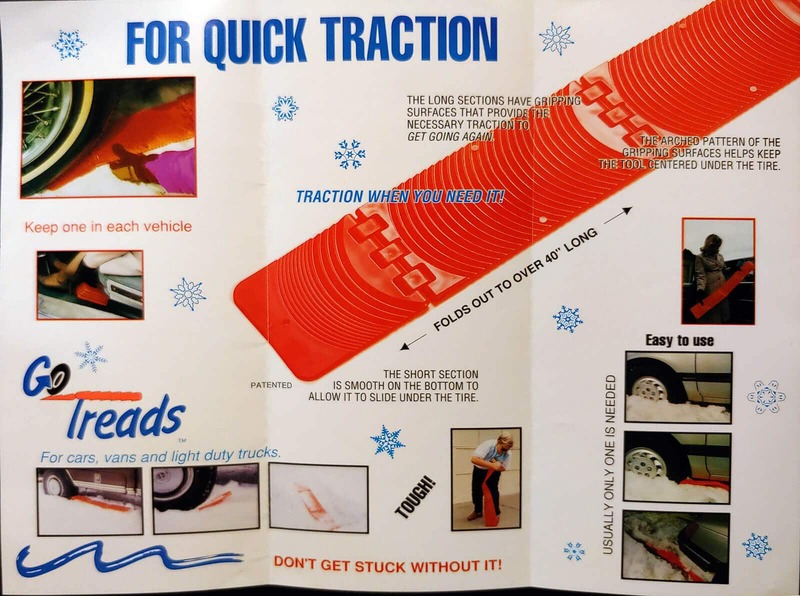 I came up with an idea to make a traction tool that would help me get through the mound of snow at the end of the driveway. I drew up the original prints in the spring of 1975 then asked some of my fellow engineers if they thought the concept might work. After gaining their assurance, I purchased a sheet of ½” thick nylon. Fortunately, I knew Paul Swanson who owned a machine and tooling shop. He accepted the challenge and made the first Go Treads parts. One Sunday morning after church, Paul handed me a paper bag with my Go Treads parts in it. I rushed home and installed the hinge pins, made from the wire of a coat hanger. The first test of Go Treads consisted of me digging a hole in the dirt and filling it with water to make a very sloppy mud hole. Then I drove our car into the mud and got it stuck. The Go Treads got me out every time I tested them. The following winter I got our car stuck in snow and they worked every time. I proved to myself that the tool would work in mud and snow. At that point, I contacted the corporate patent attorney for the company I was working at. He referred me to a large patent attorney firm in downtown Chicago. After many thousands of dollars, I still was no closer to getting a patent. Frankly, we had no more money to pursue the patent. A new home in Lousiana and a patent attorney. After a few job changes and four children later, we were living in Bastrop, Louisiana (my home state) and I found out about a patent attorney in Shreveport, Louisiana who came highly recommended as an honest guy who had a good reputation. I hired him to work on securing a patent for my invention. In late 1989 I took a job in Hutchinson, Kansas. I then got focused on getting back to preparing to manufacture Go Treads. I developed the logo and a couple of slogans like: “Get Going Again with… “, “Traction When You Need It” and “Don’t Get Stuck Without Them”. Pinto, Inc. is established and production begins. With the help of an attorney in Hutchinson, we started to draw up the paperwork to form our company. When the attorney asked what I wanted to name our company, I said that I had no idea. He said, “Let’s call it Pinto, Inc.” I hesitated about that but then said, “Well, why not. In April 1991 Pinto, Inc. became a corporation chartered in Kansas. We became fully capitalized in just a few months. Most of the funding came from family members who believed in the product but mostly believed in me. They knew that I was resolved to make a successful business from this invention. Shortly after that, with the help of our son, Aaron, our first brochure was designed and printed. I designed the injection molds and hired a die maker. I found a custom molder in Gardner, Kansas (Mid-America Plastics) and with the help of their plastics engineer, Gary Padgett, we selected a plastic that would be durable enough for the extreme conditions Go Treads would be exposed to. 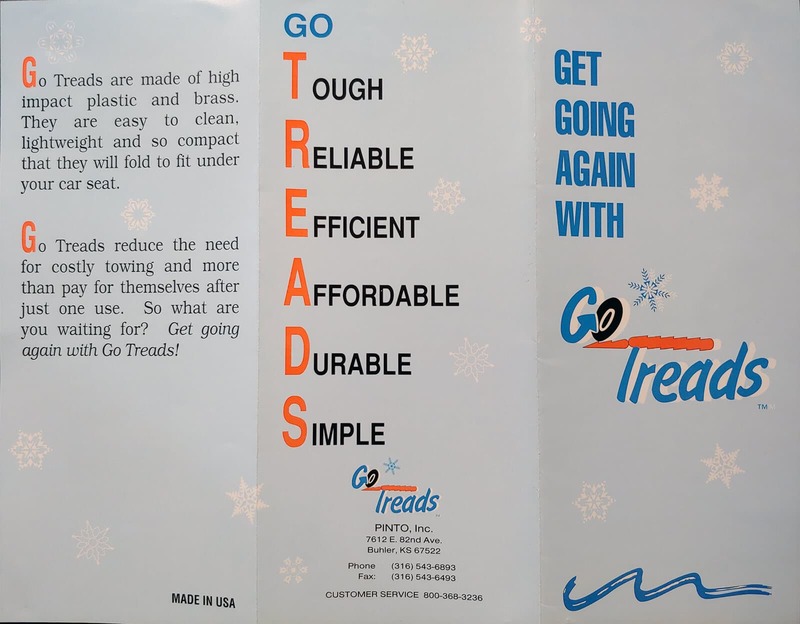 On July 5th, 1991 we molded our first Go Treads. Many of my family, including my wife and four kids gathered around the molding machine to watch the first Go Treads come out of the molds. It was a very humbling, deeply satisfying emotion that came over me as I held the first assembled production Go Treads. Holding that still warm, orange Go Treads tool in my hands, I realized the reward for never giving up on a dream. It took sixteen years from making my first drawing to making our first production run of Go Treads, but with the help of my family and friends, it became a reality. This was originally published by GoTreads.com, a link to that is here.